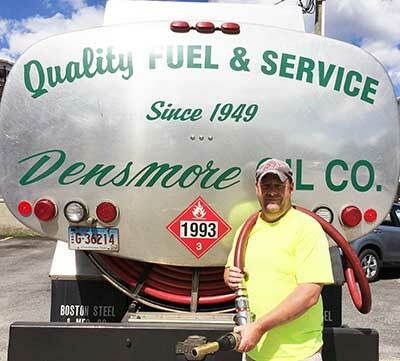 We at Densmore offer affordable home heating oil, including environmentally friendly Bioheat®, and reliable heating oil delivery to homes in our Eastern Connecticut and Southwestern Rhode Island community, including Colchester and Mystic, CT as well as Westerly and Hopkinton, RI. The fuel we deliver is ultra-low sulfur heating oil which contains no more than 500 ppm of sulfur content; this is drastically less sulfur content than standard home heating oil which means it is safer for your home and our environment, and it is also cleaner than natural gas. Keeping your home and family safe and warm each heating season is our top priority. Services like automatic fuel delivery, budget plans, and fuel pricing plans can help to manage your fuel costs each year. As an automatic fuel delivery customer, you will no longer have to worry about monitoring your oil tank’s fuel level. We monitor your account and, based upon your previous history and elapsed degree days, determine when we will need to make your next fuel delivery. It is our responsibility as a full service oil company to ensure that your fuel oil tank never runs out of oil. Rest assured this heating season that your oil tank will always have fuel! Sign up today by calling our office! Will call is best for customers who prefer to monitor their own oil usage, burn wood, or use alternative fuels. Please call us to schedule your next will call delivery. Whether you choose our automatic delivery option or will call, you will always receive prompt service from Densmore, your local, full-service home comfort company. Example: Jane fills her tank and the price that day is $3.50. To reduce her price per gallon 4%, she wants to pay within 10 days, and she calculates her savings. If you do not choose one of the above plans, full payment is due 30 days from oil delivery.